<p>In recent years, molecular microbiology has emerged as a top, cutting-edge biological discipline, thanks to the multi-disciplinary and integrative approaches taken by investigators seeking to understand the intricacies of the microbial world and how it affects human health and the biosphere. 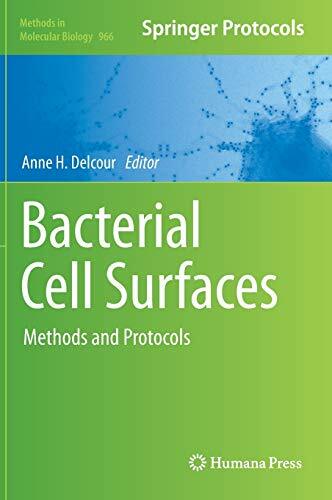 In <i>Bacterial Cell Surfaces: Methods and Protocols</i>, recent advances in structural biology, proteomics, and imaging techniques, together with the traditional biochemical and genetic approaches, are provided in order to present an exciting look into the structure, function, and regulation of the bacterial cell envelope. The detailed volume contains examples of traditional and innovative tools for the study of protein structure and function and enzymatic activities, the purification and analysis of macromolecules and their complexes, and the investigation of regulatory mechanisms and cell biological processes.&nbsp; Written in the highly successful <i>Methods in Molecular Biology&#x2122;</i> series format, chapters include introductions to their respective topics, lists of the necessary materials and reagents, step-by-step, readily reproducible laboratory protocols, and tips on troubleshooting and avoiding known pitfalls.</p><p>&nbsp;</p>Authoritative and practical, <i>Bacterial Cell Surfaces: Methods and Protocols</i> is aimed at the microbiologist, biochemist, or cell biologist, whether a beginning graduate student or a veteran experimentalist, who wishes to learn new methodologies and take advantage of the years of research and protocol optimization from the best laboratories around the world.